One of my heroes is a kid named Shaun Doss. I met Shaun during my second trip to Washington DC last summer. I was sitting in my wheelchair, in the back of the bus that was taking us to Capitol Hill for a press conference, and next to me was this cute kid who was also in a wheelchair. Shaun was six years old at the time and he was extremely shy at first. I found myself looking at him, as he tried as hard as he could to ignore me, and found myself thinking how nervous, possibly scared, and probably bored he must have been. I couldn't imagine what it must have felt like to be 6 years old, in a wheelchair, in Washington DC, in the back of the bus next to a strange guy with mechanical legs who also happened to be in a wheelchair. So I decided to strike up a conversation with the kid. At first he continued to ignore me, but then someone else on the bus handed me a picture book of DC to help me get his attention. By the time the bus finally got through the security checkpoint and we were unloaded and ready for the press conference Shaun and I had become friends. The more I learned about him the more I admired him. Shaun became paralyzed from the chest down when he was three years old when a young woman ran a red light and collided with his father's Chrysler vehicle. Shaun's seat belt failed during the accident, which is what allowed Shaun to be injured. It's such a tragic story, he has had to overcome tremendous challenges at such an early age, but once I got him to start talking I discovered a happy, energetic, playful six year old kid. Many of you have talked about how amazing my attitude is, which I appreciate, but it takes a tremendous amount of work to stay so positive. Shaun, on the other hand, seems to do it naturally. I'm sure his parents would tell us that he has his moments, but his ability to be happy is something that keeps me motivated. Recently I talked about choosing to be happy, but for a kid his age it's not about choice, it's about who he is. He amazes and inspires me! In fact, he inspired me to race him to the end of a tunnel that connects two of the Senate office buildings. It was my idea, but I never would have thought of it if he hadn't been there. We were told that the race was a little disrespectful, but a six year old kid needs to have fun! So does a 34 year old kid, for that matter! Now, there is a reason that I've chosen now to talk about Shaun. 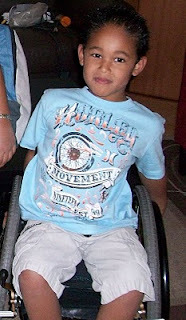 Thanks to stem cell research there is a chance that Shaun could walk again! Unfortunately the procedure that could give him this chance is not performed in this country. His family would need to travel to Costa Rica and stay there for several months for treatment and therapy. Unfortunately the procedure alone will cost over $50,000.00 and that doesn't include the cost for his family to travel and stay in a foreign country to give him this opportunity. This is an amount of money that Shaun's family simply doesn't have.